My previous post generated interest in seeing the results coded to identify new investigators and early stage investigators. Recall that new investigators are defined as individuals who have not previously competed successfully as program director/principal investigator for a substantial NIH independent research award. Early stage investigators are defined as new investigators who are within 10 years of completing the terminal research degree or medical residency (or the equivalent). 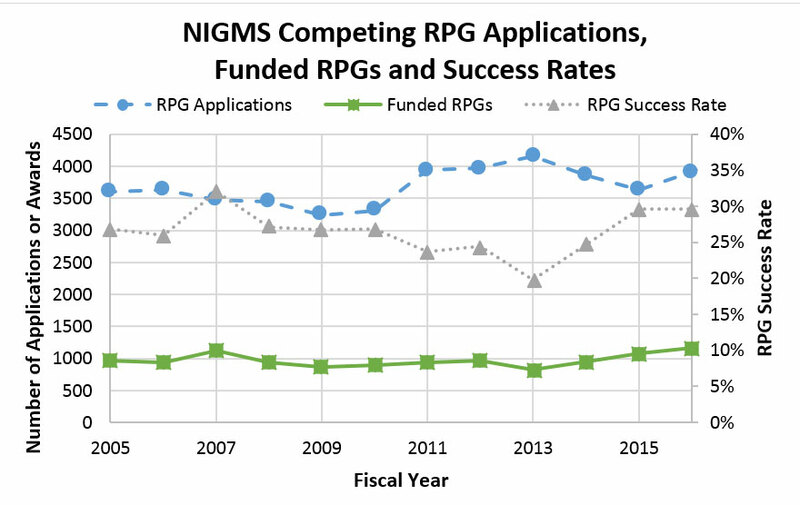 Below is a plot for 655 NIGMS R01 applications reviewed during the January 2010 Council round. 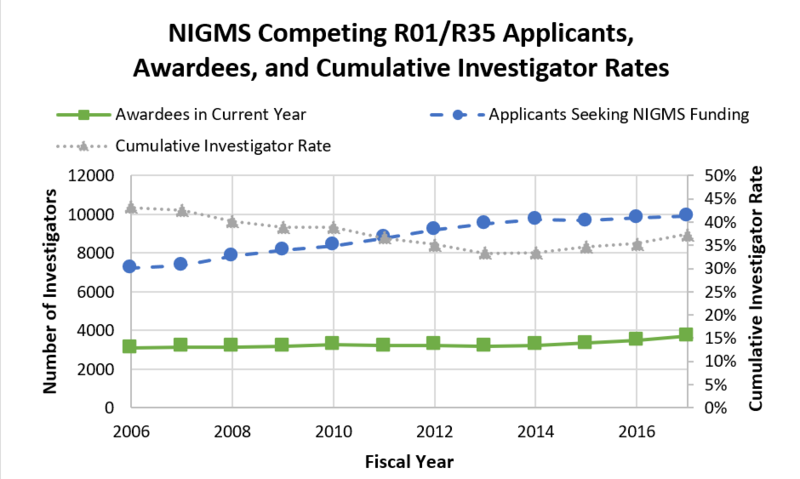 A plot of the overall impact score versus the percentile for 655 NIGMS R01 applications reviewed during the January 2010 Council round. Solid symbols show applications for which awards have been made and open symbols show applications for which awards have not been made. Red circles indicate early stage investigators, blue squares indicate new investigators who are not early stage investigators and black diamonds indicate established investigators. This plot reveals that many of the awards made for applications with less favorable percentile scores go to early stage and new investigators. 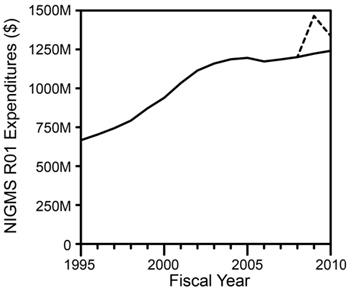 This is consistent with recent NIH policies. The plot also partially reveals the distribution of applications from different classes of applicants. 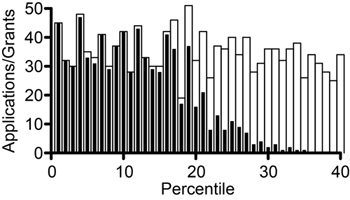 This distribution is more readily seen in the plot below. 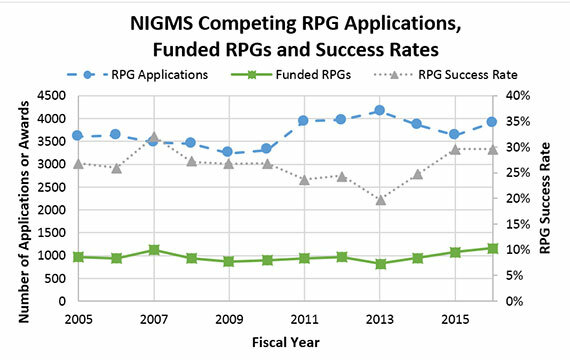 A plot of the cumulative fraction of applications for four classes of applications with a pool of 655 NIGMS R01 applications reviewed during the January 2010 Council round. The classes are applications from early stage investigators (red squares), applications from new investigators (blue circles), new (Type 1) applications from established investigators (black diamonds) and competing renewal (Type 2) applications from established investigators (black triangles). N indicates the number in each class of applications within the pool. 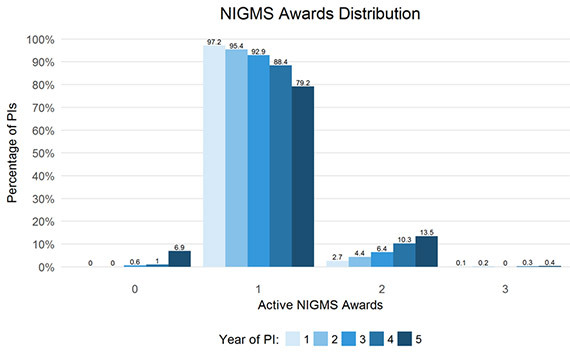 This plot shows that competing renewal (Type 2) applications from established investigators represent the largest class in the pool and receive more favorable percentile scores than do applications from other classes of investigators. 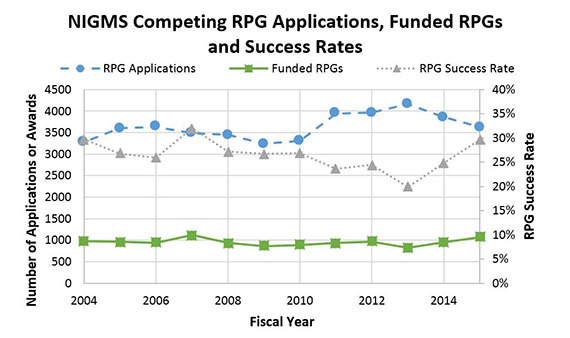 The plot also shows that applications from early stage investigators have a score distribution that is quite similar to that for established investigators submitting new applications. 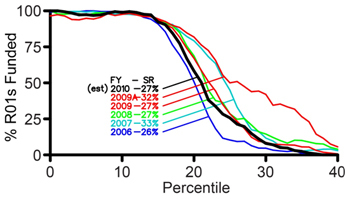 The curve for new investigators who are not early stage investigators is similar as well, although the new investigator curve is shifted somewhat toward less favorable percentile scores.